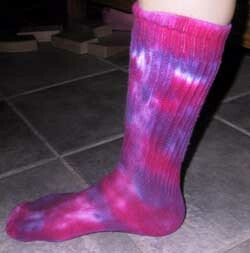 How can I tie dye socks? Procion MX dyes are among the very best for dyeing cotton and rayon. 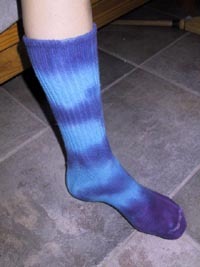 Socks are boring, socks are bland - unless you dye them. 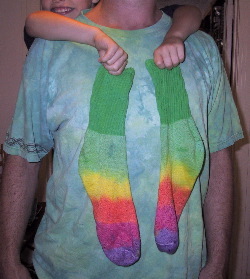 Socks do not need to be tied to have the look that everyone immediately identifies as tie-dye. 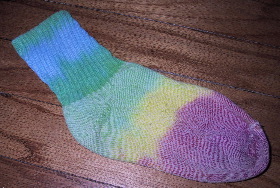 Socks can be dyed best by simply laying them flat and dripping dye onto them, then flipping them over and repeating the same design on the other side. If you want white areas left between the colors, ties or rubber bands will resist the dye, leaving white areas; otherwise, leave them untied. Don't buy cheap socks, if that means that they are uncomfortable or undersized. Your work is worth the cost of even the most expensive of cotton socks. Buy soft, comfortable socks. 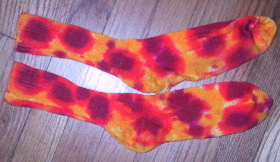 Mercerized cotton dyes better than even ordinary cotton, as the processing makes the cotton able to accept more dye, but the only mercerized cotton socks I've found were too narrow and too tight. My favorite kids' socks are the 100% pima cotton socks from Lands' End [note: these are no longer available, as they have been replaced by 18% polyester socks, which may or may not be as satisfactory for dyeing, depending on where the polyester is located in the sock]; my favorite women's knee socks come from the Vermont Country Store, but I've found some good ones in our local Target department store. 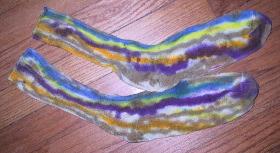 Maggie's Organics sells white socks which are extremely satisfactory for dyeing, but which cost more than other sources. 100% cotton will dye well, but a small percentage of Lycra will make them stretch and stay up better. Lycra (a brand name for spandex fiber) will not dye. Sometimes Lycra has cotton spun around it, so you can't see undyed fiber anywhere in the finished sock; other socks, especially tube socks, have Lycra even on the outside, where it remains white, giving a sort of heathered effect. Polyester will not dye at all (see disperse dye for polyester); nylon will not dye unless heated with the dye in the presence of an acid such as vinegar. 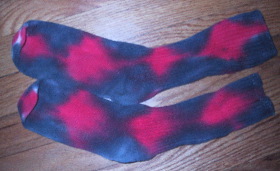 Cotton tights dye wonderfully; try to get those that are at least 80% cotton. 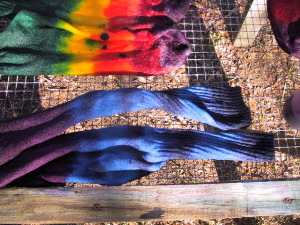 Both heavy wool hiking socks and diaphanous nylon stockings can be dyed with heat, acid, and acid dye; see Acid Dyes for Protein Fibers and Nylon. 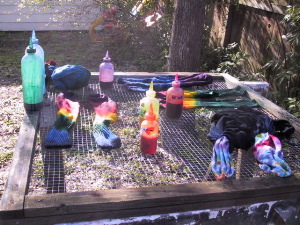 Cotton of any sort is best dyed with cool water fiber reactive dyes using the usual easy squirt bottle dyeing recipe. Following this recipe, you pre-soak the socks in a bucket of water with soda ash, wring them out with gloved hands, lay them flat, and use squeeze bottles to squirt on cool water fiber reactive dye, such as Procion MX dye, which has been dissolved in water with some urea added. 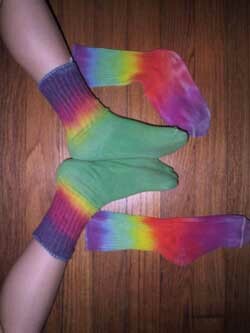 Leave the socks damp with the dye overnight, at 70 degrees F (21 C) or higher (warmer is better), then wash the excess dye out the next day. 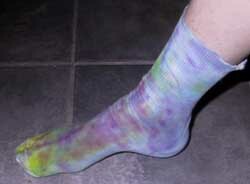 Use good fiber reactive dye - NOT all-purpose dye! Note: You cannot use an "all-purpose" dye such as Rit with this recipe! To get acceptable results in tie-dyeing with all-purpose dyes, you must submerge the fabric for extended periods of time in scalding hot water; see How can I tie dye with all-purpose dye?. Cool water fiber reactive dyes, such as Procion MX, give much brighter and longer-lasting results, with far less effort. It is best to use all-purpose dye only when you wish to dye cotton/nylon blends a single color. Most people prefer socks that are dyed in pairs. It's not difficult to make sure two socks match, if you lay them out in groups of two, and apply dye to them in the same pattern at the same time. 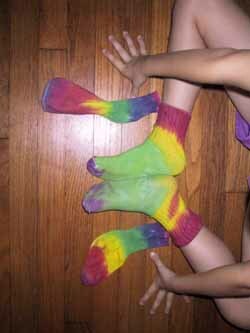 If you do this at the same time as you tie-dye other clothing, using the same colors, the socks automatically match the clothing, more or less. My favorite dyeing surface is composed of a stiff 1/4" (6 mm) galvanized wire grid known as hardware cloth, mounted in a frame to keep the edges steady, and placed atop short sawhorses or a set of table legs, out in the back yard. Window screen is too fine and collects a puddle of dye. Some dyers use layers of an absorbant material such as paper towels, or lay things out on the lawn (the dye doesn't hurt the grass, though the soda ash might, and the urea is a fine fertilizer, in moderation), or just place into rectangular glass dishes, or onto tables covered with plastic. 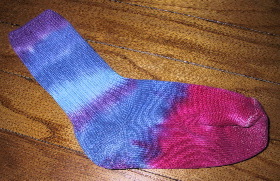 Sometimes I drip dye so heavily, on one side of a sock, that enough little hints of color come through to provide adequate clues as to what colors to place where on the second side of the sock. Not always, though. Typically, what I do is dye one stripe on the top side of each of a pair of socks, then flip the sock partly over, holding it by the undyed end, to do the same on the back side. Next, I pick up another dye bottle and repeat the process, overlapping somewhat with the previous color to allow the colors to blend. I must keep a box of disposable gloves handy, or, preferably, a bucket of rinse water handy to rinse my gloves off, for I inevitably get dye on my glove while flipping the sock by the dyed end, and then wish to avoid spreading that color to another color area of the sock. 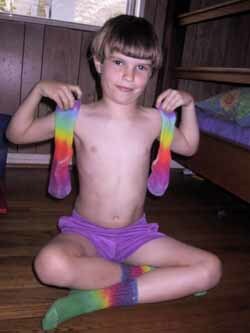 My younger son refused to wear any socks but rainbow dyed ones, from ages two through six, and still prefers them to all other socks. Other parents ask me where I bought them. 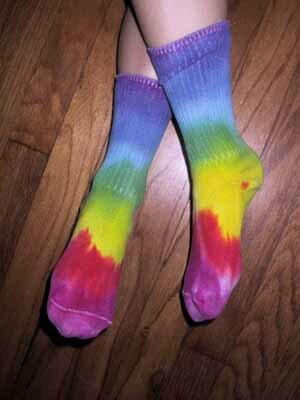 Rainbow socks always look great. You can make the stripes horizontal or vertical. 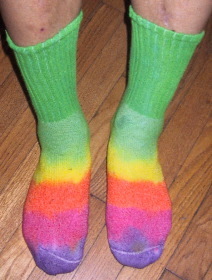 A strict rainbow sock starts at red, then proceeds through orange, then yellow (a wide strip of yellow, as the adjacent colors tend to overrun it), then green, turquoise, blue, and finally violet. 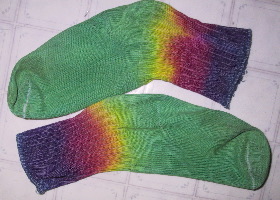 Modified rainbow socks combine only adjacent colors from the rainbow next to each other, but do not proceed in order; for example, they might start with purple, go through fuchsia, yellow, and then green, or blue, green, yellow, then back through green and blue again. The main rule is simple: never put opposite colors next to each other. Do not put scarlet next to purple, as yellow from the red will mix with purple to make mud brown. Mud does not belong in the rainbow. Never put red next to green, orange next to blue, or yellow next to purple. Always separate red from purple with a band of fuchsia. 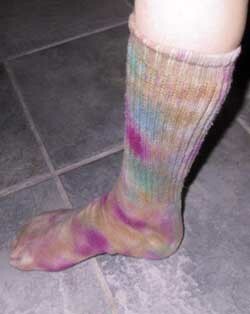 Socks mottled with various colors can be subtle, or clown-like. You can even make more precise designs, such as argyle. Do you work in an office where tie-dye would be considered wildly out of place? The stealth sock shows only staid navy, black, or khaki above the shoe, but erupts into bright colors such as red and orange when you take your shoes off! 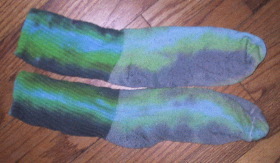 Sadly, all of my husband's stealth socks proved so popular that they have been completely worn out and thrown away. I need to make some more. The pair pictured to the left are too bright in the upper portion to truly qualify as stealth socks, though they do give a misleadingly normal impression with casual wear. 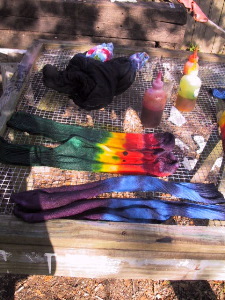 As you can see, it's easy to make wonderful hand-dyed socks. Go ahead and try it! To locate sources for mail-ordering fiber reactive dye (which is almost always both cheaper and better than locally available dye), see my Sources for Dyeing Supplies page. For answers to all manner of questions about dyeing, see the FAQs on dyes and dyeing section of this web site, or use the navigation bar, at the top and bottom of almost every page on this site, to examine other pages about the art of hand dyeing.